Here is a pic of my breakfast. It really isn't a good pic either. It was more of an afterthought. 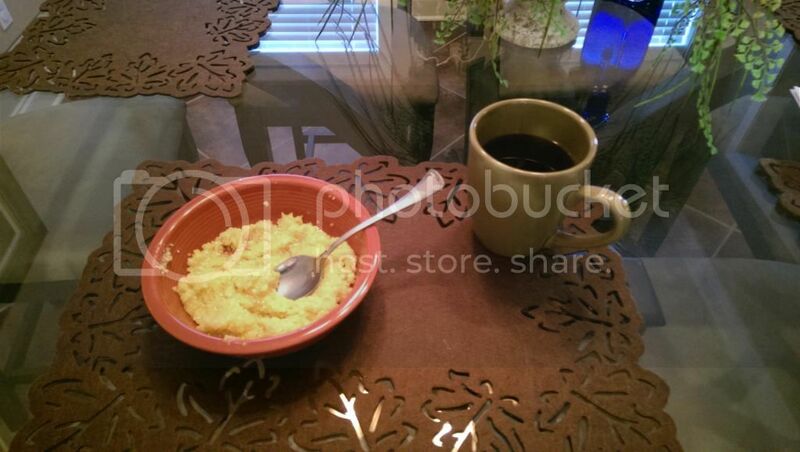 It is just a bowl of grits and some black coffee. This breakfast made me reflect on what I am thankful for today. Growing up all of my family had a trade, and all of their friends did as well. I grew up around mechanics. machinists, and welders. From the time I was old enough to walk I was around a shop helping and watching. Over my childhood I picked up on lots of skills that most folks will never get to enjoy. Most of the folks I hung around growing up did things that just aren't done these days. I grew up silver soldering, brazing with clothes hangers, rebuilding and repairing old single cylinder hit and miss engines, etc. I was driving a tractor before most kids were riding a bike on their own. I learned to weld, run a milling machine, and run a lathe at a young age. I am thankful that I was able to learn skills that will be useful as long as I live, as well as learn things like the previous generations did the, prior to automation of most equipment. That brings me to my breakfast. My grandpa has always had a grist mill. As a child I would help him grind corn. 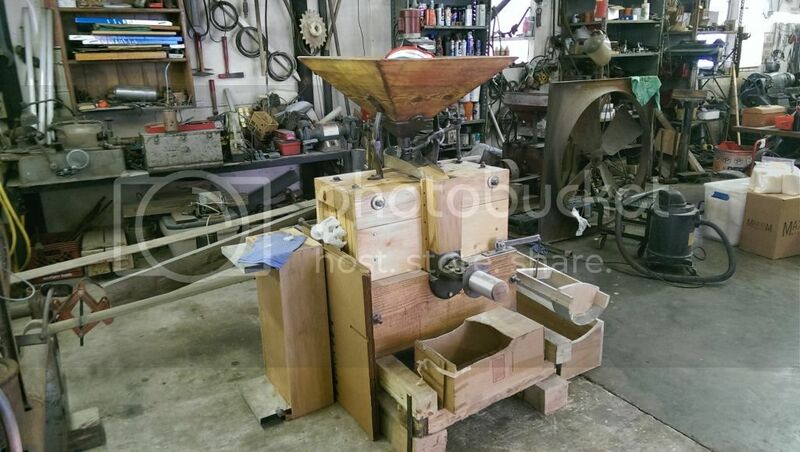 We would travel to local fairs and demonstrate the grist mill for people. 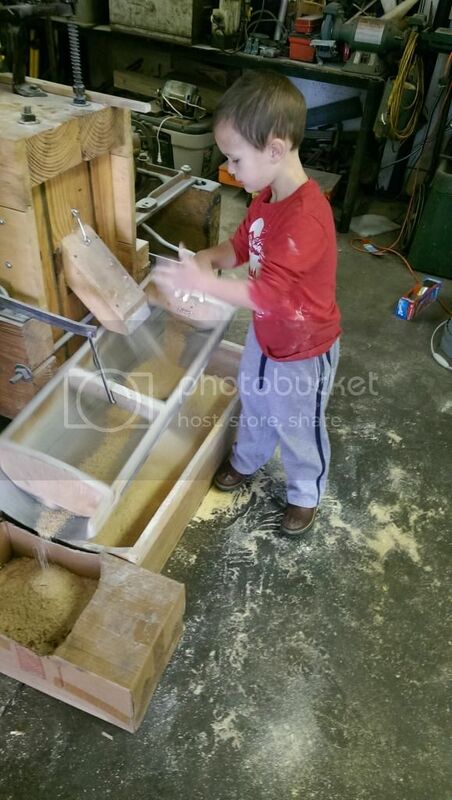 The other day he told me he was going to be grinding corn. I took this opportunity to show my 5 year old son how corn meal is made. We also decided to grind some grits while we were at it. That's where my breakfast comes into play. That bowl of grits was ground by 3 generations of my family and hand sifted by myself and my son. Hopefully he will pick up on some of the skills I learned as a child. Here is the power plant. 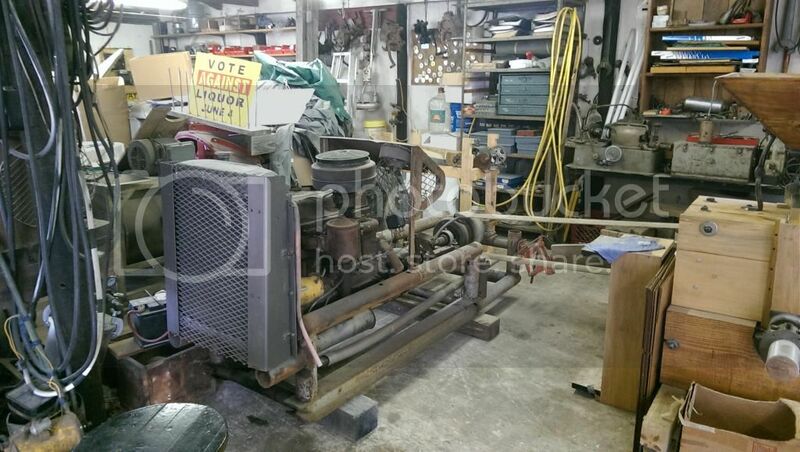 It is a straight 6 and 3 speed transmission from a late 40s Chevrolet pickup. It has a short driveshaft connected to a large flat pulley. The canvas belt drives the mill. The belt drives the mill. The shaft has stones attached to it inside the wooden box. You can adjust the tension on the stones to change the texture of the corn meal. If you adjust it out far enough it will grind grits. The corn goes in the hopper on top. The corn feeds down a chute from the bottom of the hopper. You can adjust the amount of corn fed to the stones by adjusting the chute's distance from the hopper. Once the corn goes down the chute, it hits the stones, is ground, and comes out the opposite end. It drops into a mesh shaker. The husks and bigger articles are held in the mesh. The meal falls through into a box below. There are several cams and rods off of the main shaft. One of them connects to the mesh shaker. It shakes it back and forth, helping the meal fall through the mesh. The husks and everything else shakes to the end of the shaker and falls into a separate box. That's awesome! I want one! Nice, looks safe! Thanks for posting. The large exposed belt and reciprocating equipment makes for a sharp learning curve. Lose a finger and you won't touch it again. Back in the day problems had a way of sorting themselves out. That's a great story with great pictures. Either way, I grew up similarly to you and am attempting to raise my boy the same way. It's the best way. Grits refers to a ground-corn food of Native American origin, that is common in the Southern United States and eaten mainly at breakfast. Modern grits are commonly made of alkali-treated corn known as hominy. Grits are similar to other thick maize-based porridges from around the world such as polenta. "Instant grits" have been processed to speed cooking. The word "grits" derives from the Old English word "grytt," meaning coarse meal. [url=http://en.wikipedia.org/wiki/Grits#cite_note-1][/url] This word originally referred to wheat and other porridges now known as groats in parts of the UK. Maize, unknown in Europe in the Middle Ages, is a food derived from corn (in U.S. English, this is a specific New World plant; however, "corn" is used generically to describe cereal grains in the U.K. and in many European regions). "Grits" may be either singular or plural; historically, in the American South the word was invariably singular notwithstanding its plural form (cf. such food names as "spaghetti" or "linguine", likewise plural in form). It can be done with hominy, or straight corn. Grits are actually a byproduct of the grinding. If you are grinding straight meal you adjust the stones to grind everything fine. For grits the stones are backed off to separate the center of the kernel from the rest. With grits you end up with 3 phases, versus 2 when you grind corn. You get the husks. which are discarded, the grits, and corn meal. The meal you get from grits is a little coarser than the meal you would typically grind. The meal falls through the sifter and the grits go out with the husks. Then you have to run the husks through a more open screen to let the grits fall through and separate from the husk. There is a way to rig a fan up below the screen to blow the lighter husks away from the grits, but we didn't have anything rigged up to do that so we hand sifted. It is a long drawn out process that still yields about 4 times more meal than grits. Even after sifting you have to soak the grits in water overnight prior to cooking. This allows the grits to absorb some water to reduce cooking time. It also floats any remaining husk to the top so you can scoop it out prior to cooking. Dad has several grist mills. He runs his off a flat belt from his Farmall M or a 8hp constant rpm motor. Meh, looks like a lot of work for no good reason. Grits are free with an EBT card op! You're lucky to still have your grandpa around. I was lucky enough to have mine until I was about 43. I'll offer you some advice that I wish I had followed to a greater extent. Sit down with him and a video camera and get as many memories and stories about his and his family's history, experiences, etc as you can. It might seem a bit awkward at the time but I promise you that it'll be something you treasure when he's gone. It'll be something your boy will benefit from. I've got some from mine but it's a small fraction of what I could have gotten and I still kick myself for not taking the time to do it. 0/10 for the breakfast photo-10 GAZILLION/10 for the accompanying photos and back-story!!!! 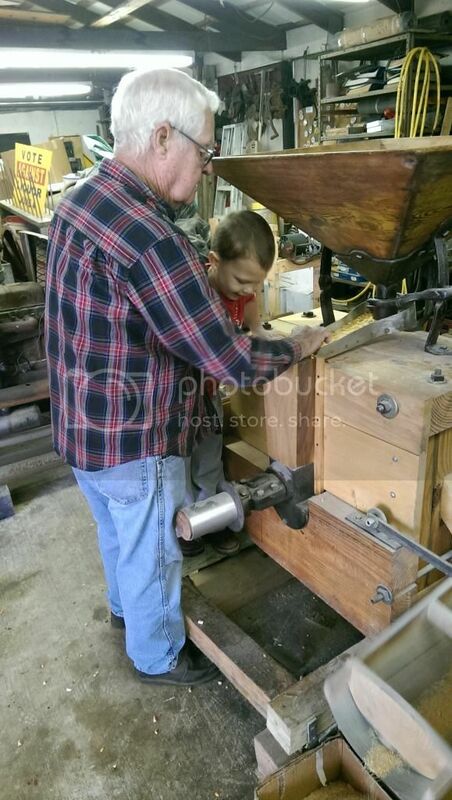 I am 65, and blessed to have had many good times such as this with my paternal grandfather (my maternal grandfather died a month before I was born), my son, and now my 5 grandkids. On this day of Thanksgiving, you and I, have a lot to be thankful for! Money can't buy these moments! Bless you and yours. Grits alone are a 7/10. The background for how those grits came to be cannot be awarded a score, nor increase the score of the grits. It would be unfair to judge another 'not a [breakfast|brunch|lunch|supper|dinner|snack] picture' picture again due to the priceless nature of said background. Good on you and yours for carrying on such a wonderful tradition and sharing a valuable skill with others. No guns, reloads, pics of wife or napkin plus I hate grits.